Over on the RoundTable blog, I've been talking a lot about the plans for Mokuhankan moving forward this year, and it's time to get something actually under construction! First, a tiny bit of 'history'. 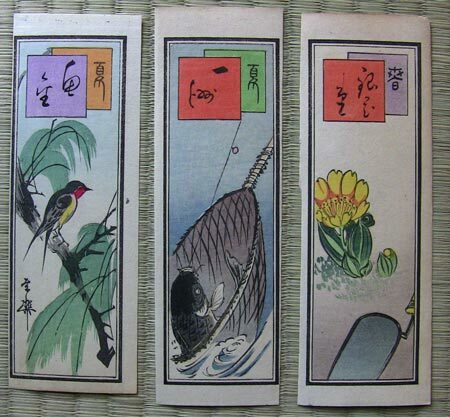 From late Meiji up until the wartime period, collecting small prints known as senshafuda (or alternatively senjafuda) was a common activity. These prints had their origin in the fuda labels that travellers and worshippers pasted on the walls and gates of shrines during their visit. A recent story in the Japan Times gives some background. 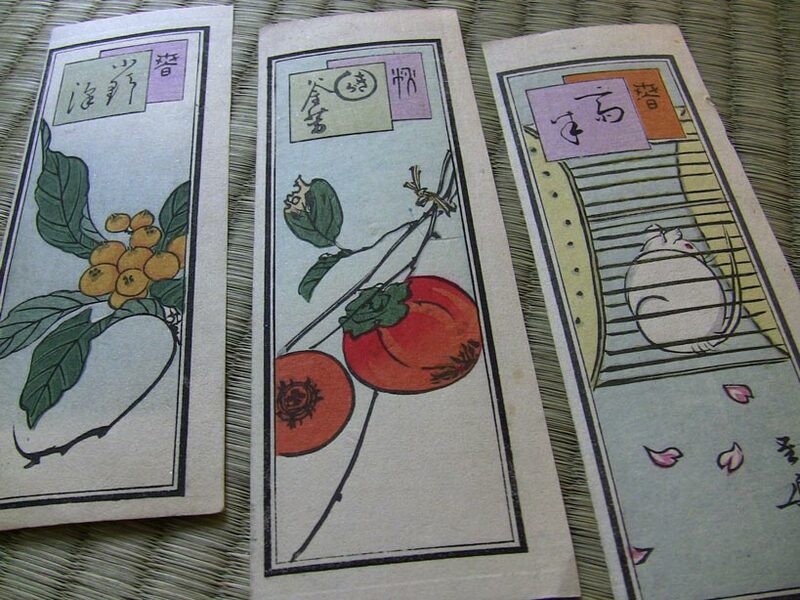 'Labels' they may be, but they are actually full-colour woodblock prints. This particular set wasn't printed on very high-quality paper, but even so, the colours blend beautifully, and the carved lines clearly show that they are 'real' prints. So ... where are we going with this? 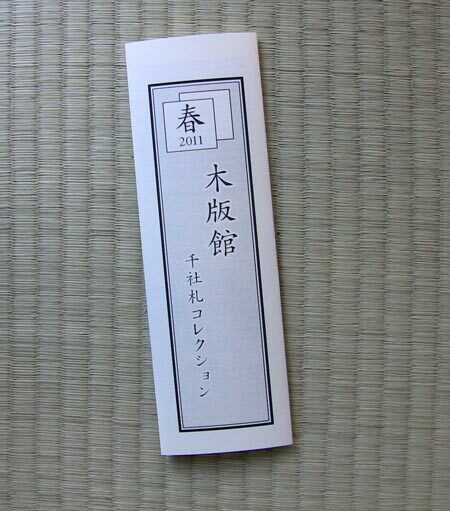 Well, as mentioned in the previous RoundTable threads, one of the major reasons for these upcoming Mokuhankan projects is to provide work for the younger carvers and printers. 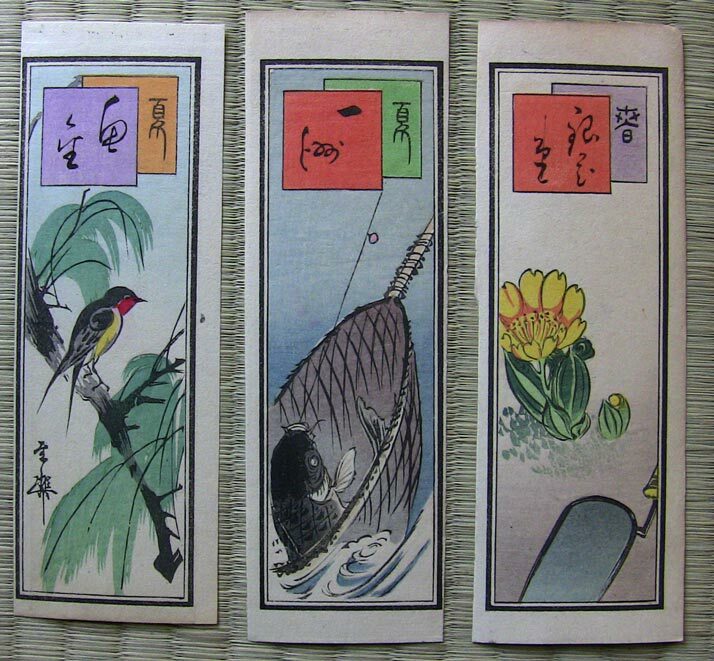 Prints like these senshafuda are within their capabilities, yet will provide enough of a challenge that they are not being 'spoon-fed'. And ... they seem quite attractive to potential purchasers/collectors, I think, both here in Japan and overseas. So how about this idea? 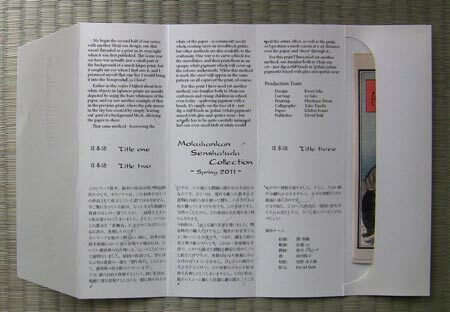 Each package contains three senshafuda. I have just picked three at random here to demonstrate the packaging idea, but the actual prints in the set would of course be 'themed' - for the first set, I have asked young illustrator Kaori Seki (who has designed this month's print in my Mystique series) to get back to me with designs projecting a spring theme. If this thing does indeed fly, then we would follow with three more seasonal sets (at least) over the course of the coming year. I have to get downstairs to my printing bench, so can't chat too much more about this just now, but I'll post again tomorrow with discussion of the projected price, etc. I'm looking at a target for these packs of around the same price as one of my current Mystique prints - $35 - but this wouldn't be a subscription project. 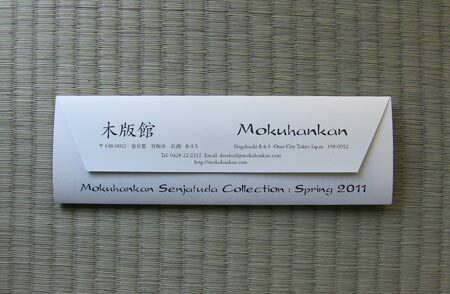 These senshafuda packs would stand alone as independent items for purchase. I love this idea. Great for your apprentices, and a new "product line", so to speak. These look like they would also make great gifts. I most enthusiastically agree. Your packaging design is, as always, wonderfully attractive. 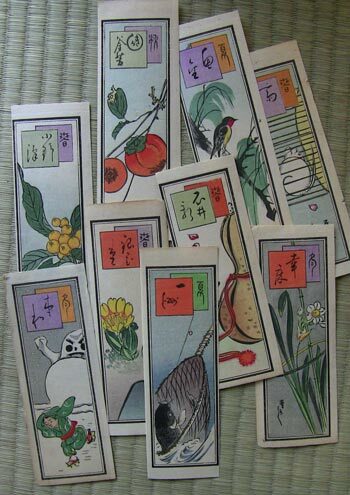 Not only the images and the history but also the very shape and size will help to make the senshafuda an attractive product line. 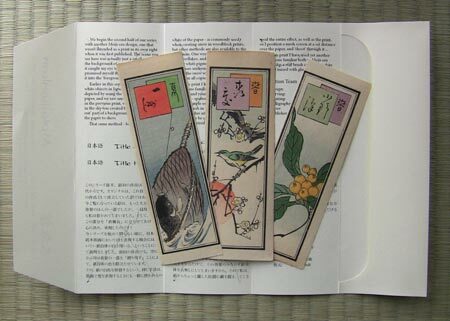 This seems perfect for Mokuhankan and, even more exciting to me, it presents an ideal opportunity to a new generation of people who live in a 'global village' to access the fascinating world of Japanese woodblock prints. It promises to be within their means to own them, give them as gifts, collect them and, for some, to venture into making them. The packs provide the instant gratification of immediately owning several prints and the variety within each theme pack encourages comparisons which, I dare say, will lead to wanting more packs. I wish you much success and will watch this development with great interest. I think that this is a great idea. I was introduced to senjafuda by fellow Dave Bull collector Toshikazu Doi when I visited Japan. He showed me just a small part of his extensive senjafuda collection. They were colorful and beautifully designed within the constraint of the high aspect ratio. This reminds me of print #5 from the third surimono album. 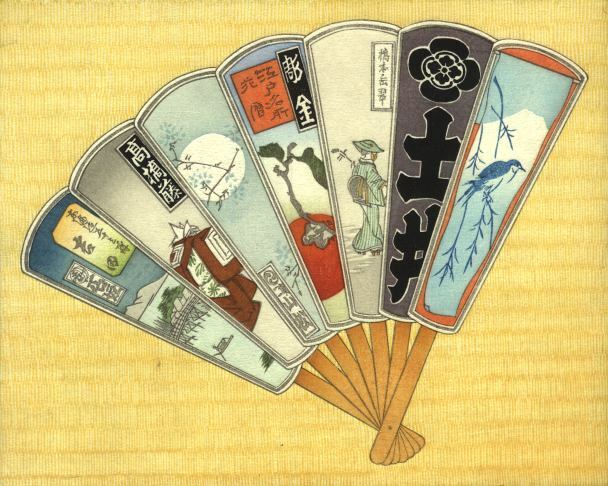 Doi-san's personal senjafuda is the second one from the right with the Japanese characters of his name (Do I). I'm looking forward to seeing how this idea develops. I just got an email from Doi-san; he has a 'date' with Seki-san lined up for the weekend. She'll be visiting his place on Sunday to spend some time getting a 'lesson' in senshafuda history, while browsing and studying his collection. Doi-san suggested that I come over too, but I'm going to have to be a 'good boy' and stick to the bench, I think. I've fallen way behind on the printing, and if I don't keep getting stuff out the door at least roughly on schedule, there won't be any senshafuda project! David, Thank you for continuing to be a source of inspiration. I love this idea, and am looking forward to seeing it unfold! Yes, a good idea/project. But will the senshafuda be Dave's labor, or a band of up and coming artisans? Support for young carvers/printers entering the craft is fantastic. Here in Kyoto, young men and women are doing just that, and they are good! So, will this project be carved/printed by Dave, or supervised by him and done by the band? Richard, if you move ahead to the next couple of posts describing the project, you will see that I myself will not be doing any of the actual labour. For this project, I will be publisher (and I guess the 'artistic director'). And I'm going to take all the profit! Hah! This is a fantastic idea. I also agree with the idea that they would make great gifts. I personally would like to see them unbundled as well, as one might want to select a different combination as a gift.